Organizers of the volunteer-initiated project that will see Prince Edward County’s Millennium Trail rehabilitated and smoothed from the Carrying Place launch to the trail head in Picton assured Committee of the whole Thursday the effort will be finished on time and under budget. Acquired by the County from the Canadian National Railway in 1997, the Millennium Trail is a repurposed abandoned rail line that was converted into a multi-use recreational trail. The trail is popular amongst a wide array of recreational enthusiasts year-round, including cyclists, hikers, snowmobilers, ATV riders, and cross-country skiers. The 46-km multi-use trail stretches from Carrying Place at County Rd. 64 to Picton at County Rd. 49, also passing through Consecon, Wellington, and Bloomfield. Project co-ordinator Barry Davidson was at Shire Hall to provide an update on the project that aims to re-surface the trail with limestone screenings, install kilometre makers and way-finding signage as well as the construction of launch and and parking areas at various locations along the route. 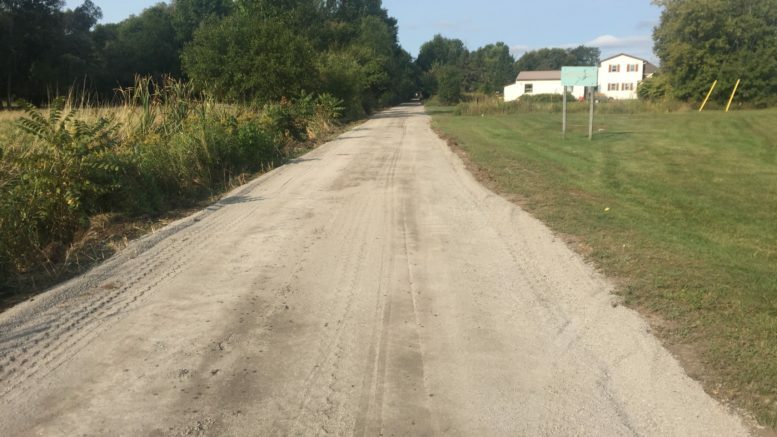 Commencing in August 2018, the rehabilitation work (brushing and resurfacing) started where the Rotary Club of Wellington project ended at Hwy 33 just east of Wellington and advanced towards Picton. From the starting point, the trail was rehabilitated all the way east to County Road 49, including the fork terminus at Lake Street and the short spur leading to Upper Lake Street. In total, rehabilitation of 17.1 km of the trail was completed in approximately six weeks and volunteers spent 300 hours brushing and another 300 hours managing the project. The rehabilitation project undertaken by volunteers came about after tenders to commercial firms were well over what the municipality had appetite for. The total cost to rehabilitate 17.1 km of the trail was $186,904.54 (including HST and HST rebate). Or $10,930 per kilometre which, when compared to the lowest bid price received during tendering in 2018 of $26,760 per kilometre plus HST or a savings of nearly $16,000. Relatively straight forward surface work will recommence later this spring but the Trail Improvement Ad-Hoc Committee will be determining the best and most appropriate course of action for a pair sections of the Millennium Trail that goes through provincially significant wetlands. Davidson explained the trail goes through wetlands at Slab and Hubbs Creeks in Hillier. “Hubbs Creek floods in the spring but dries up in the summer months. Slab Creek has been under water for two years due to beaver dams alongside the trail on private property. The beavers determine the water level,” Davidson told councillors. “We have to decide what we are going to do with the parts of the trail that go through these wetlands. The whole project is going to be completed at the end of this year and we will start on the easy portions from Hillier and Carrying place. Between now and the fall we have to decide what to do with the wetlands. Davidson said any work in this area would be put off until late September or early October once water levels are at their lowest, nesting season is over and the wildlife activity is at its lowers. He added that organizers would be meeting later this month with Quinte Conservation to determine what options might prevail. In terms of rate per km, Davidson said the 15 Km from Carrying Place to Hillier should be completed at the $10,930 per km level but the work in the wetlands will naturally cost more. But even with the expected elevated costs for the stretches of wetlands, Davidson said the project will come in under budget. Between the municipal portion that comes from a capital sustainability reserve, donations and grants, the project is working from a total of $626,566. After expenses to date are calculated at $192,490, the project still has $434,000 with which to work with. Councillor Andreas Bolik congratulated the group on their work to date and mentioned that this project could be used as an example for other volunteer groups.